Our domain expertise has enabled us to provide a gamut of high quality Stainless Steel Rivets including Blind Rivets, flat Rivets, Roundhead Rivets. These rivets are made using optimum quality raw material procures from trustworthy vendor-base. Our team of expert professionals manufacture them using updated technology and high-grade tools and equipment ensuring best outcome for our valued patrons. Customers can avail customization facility from us to get the desired product as per their given specifications. 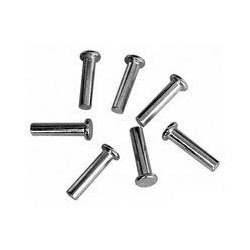 Round Head Rivet are one of the oldest and most reliable types of fasteners. Rivets consist simply of a shaft and head which are deformed with a hammer or rivet gun. Usually one head is factory formed while the other is formed by clinching metal after the rivet has been inserted.Stainless Steel Rivets are used today in applications where reliability and safety count. The setting of solid rivet requires access to both sides of a structure. Stainless Steel rivets are driven using a squeezing more. 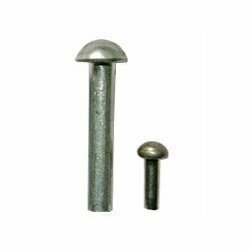 Extensively used to join different material of varying thickness, our Flat Head Rivet are manufactured in conformation with industry standards. Manufactured using optimum quality raw material, these rivets are acknowledges for their light weight, durability, mechanical strength, and easy installation. Available in various sizes, these are offered at industry leading prices. 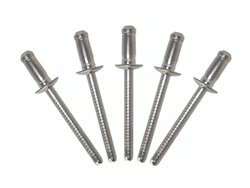 Looking for Stainless Steel Rivets ?